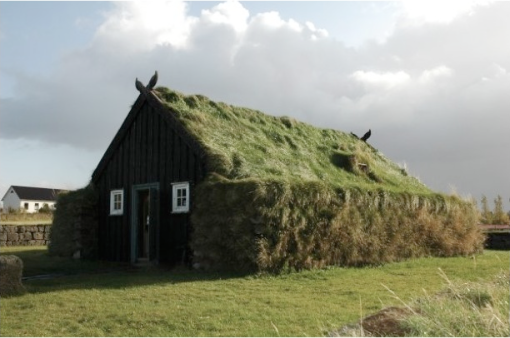 Green Roofs may have been in use for thousands of years in Scandanavian countries. Birch bark waterproofing was used over a wooden roof and sod was placed on top of it to hold the birch bark in place. The natural oils in the bark maintained the water proofing. Today's Green roofs used existing models as an end goal but needed to incorporate more flexible technology to accommodate changing architecture and materials. This simple concept can be applied to more complex systems. Many variations exist on this basic model. Systems using vegetated trays accommodate drainage for heavy rain events in urban environments. 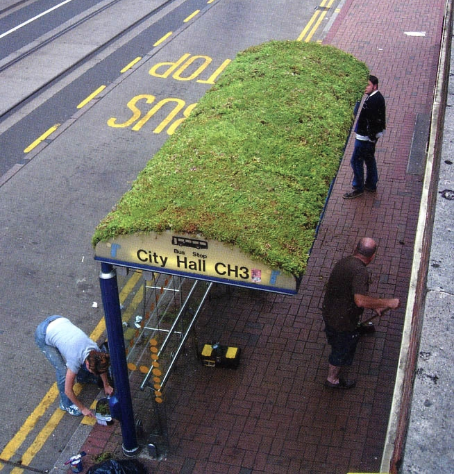 Urban "Tray Based" green roofs can be custom "coiffed" for specific plantings. These flexible systems give us options for all sorts of structures...when we think about it...doesn't it seem like a good idea to turn carbon dioxide into oxygen and manage storm water at the same time? A WIDE VARIETY OF INNOVATIVE VAT SYSTEMS ARE EMERGING. THE SLIDE SHOW PRESENTS A FEW ALTERNATIVE WIND SYSTEMS THAT WE BELIEVE ARE WORTH CONSIDERING. THE ACCOMPANYING BOOKLET PROVIDES SOURCES. VAT NAYSAYERS POINT OUT THAT THESE SYSTEMS HAVEN'T BEEN ABLE TO PRODUCE PROMISED RESULTS AND SHOULD BE DISCARDED. IN RESPONSE TO THAT, SAFE HARBOR BELIEVES THAT SUSTAINABLE ENERGY SYSTEMS SHOULD BE AFFORDED THE SAME BIRTHING PERIOD AFFORDED TO CARBON. REMEMBER THE THREE REASONS WHY AUTOMIBLES WOULD NEVER BE SUCCESSFUL? "THEY ARE UGLY, THEY BREAK DOWN AND THEY SCARE THE HORSES.". FUTURE ZONING ON THE OUTER CAPE MAY CONSIDER WIND SHED VALUES AS A PROTECTED NATURAL RESOURCE. THIS WOULD PROTECT NEIGHBORHOOD ACCESS TO WIND AS AN ENERGY RESOURCE. FORWARD LOOKING COMMUNITY PLANNING SHOULD CONSIDER ENERGY ACCESS ISSUES SUCH AS ONE NEIGHBOR'S TREES OR STRUCTURES BLOCKING WIND OR SOLAR ENERGY TO ANOTHER NEIGHBOR'S PROPERTY. When using concrete near wetland resources, easy techniques are implemented to protect ground water. Concrete and rinse water characteristics can create nutrient over loading. This publication includes green building techniques that protect ground water quality. FREE PUBLICATION: Download "Concrete Management"